Mitch McConnell is claiming he's the victim of "Watergate-style" tactics; while the real modern Watergate scandal has gone ignored. This morning, Mother Jones dropped a bombshell of a story revealing Senator Mitch McConnell and his top aides discussing how they planned to use Ashley Judd's mental health and religion to smear her in a political campaign. (Judd, a potential Democratic challenger to McConnell, recently announced she would not run). The Republican Party has reacted with anger, claiming that the story, based on a recording given to reporter David Corn by an anonymous source, is based on "Watergate-style tactics," insinuating that some type of break and entry occurred at McConnell's office. The claim appears to be a distraction at this point since there is no evidence that the recording was illicitly obtained. Mother Jones says its lawyers vetted the tape, as the Washington Post's Greg Sargent notes. While I'm certain much of the political press will leap at McConnell's unsubstantiated claims of Watergate tactics, there's another scandal of political espionage and snooping that has not received much attention. And in an ironic twist, it relates to McConnell since the organization at the center of it is one of the senator's closest allies in Washington. First, let's establish what constitutes "Watergate-style tactics." In June of 1972, a group of former CIA officers, working on a plan concocted by Richard Nixon and his closest aides and financed by a secret campaign fund, broke into the offices of the Democratic National Committee—housed temporarily in the Watergate building by the Potomac—to install secret recording devices (bugs) and to steal information from Democratic leadership. The plan was part of Nixon's reelection effort that year. During one of the attempts, a piece of tape left on a door in the DNC office tipped off a security guard to the trespassing Nixon operatives. The political press largely ignored the burglary until two intrepid Washington Post reporters dug deeper into the scandal, which of course led to Nixon's impeachment hearings. In the modern age, the same goals of the Watergate break-in can be achieved without physically breaking or entering any actual buildings. Modern hacking technology allows a criminal to send a PDF or another file to their target, and as soon as the file is opened, every e-mail, every keystroke, every document and database on that victim's computer can be accessed remotely by the criminal. Such technology has been used by the American government to go after al Qaeda and other terrorist threats. But recent evidence shows that the Chinese government and even American interests appear willing to use this form of hacking against political targets here in the United States. In the Fall of 2010, attorneys for the US Chamber of Commerce, the largest big business lobbying organization in the country (and not be confused with local chambers of commerce), began working on a secret plan to discredit and destroy their political opposition. The Chamber had just spent a record amount on the midterm elections to elect a new, much more Republican Congress—using corporate money, thanks to Citizens United. The Chamber had also faced a series of scandals, from a story in the New York Times revealing that it had laundered charitable money from AIG for political purposes to a story I wrote for ThinkProgress revealing that it had solicited foreign money for the same legal 501(c)(6) entity used to run partisan campaign ads. The Chamber's attorneys began working with a crew of military contractors—including HBGary Federal, Berico, and Palantir—to devise a plan that could be used against the AFL-CIO, SEIU, the Center for American Progress, US Chamber Watch and other liberal critics. Some of the proposals were simply unethical: efforts to plant false documents, impersonate liberals, etc. HBGary Federal inadvertently revealed the entire plot by threatening a splinter group of Anonymous, the hactivist collective, which then proceded to steal all of HBGary Federal's e-mail and release them onto the web. Scott Keyes and I first broke the story, using the e-mails. However, out of the 70,000+ e-mails, the initial press coverage about the HBGary Federal scandal related to simply the unethical sabotage plans in one or two of the proposals. About a week after the initial story broke, we came upon another series of presentations buried within the e-mails, which included illegal hacking tactics well beyond what we had initially reported. The presentation notes that one of the consultants involved in the effort had expertise in “Information Operations” and could use “computer network attack,” “custom malware development” and “persistent software implants.” Boasting that they could establish a “fusion cell” of the kind “developed and utilized by Joint Special Operations Command (JSOC),” the contractors' presentation claims they could use “zero day” attacks to exploit vulnerabilities in Flash, Java, Windows 2000 and other programs to steal data from a target’s computer. This hacking technology—which allows one to seize control of a target computer without the victim's knowledge—mirrors the type of cyber tactics used by the government against terrorist threats. Notably, HBGary and Palantir, two of the firms involved in the plan, have extensive contracts with the US military. In fact, as I reported for The Nation in March of this year, the Chinese military hackers exposed recently by The New York Times and the firm Mandiant solicited a website set up by HBGary to develop some of their hacking technology used against American firms and other interests. There were no discussions in the leaked e-mails about the legality of using such tactics. Rather, the Chamber’s attorneys and the three contractors quibbled for weeks about how much to charge the Chamber for these hacking services. At one point, they demanded $2 million a month. HBGary Federal and their partners were scheduled to meet the Chamber to finalize the deal on February 14, 2011, just days after Anonymous stole their e-mails and revealed the plans. As I've noted before, the Chamber, despite e-mails showing they had met with their law firm to discuss the project, denied any knowledge of the proposal and said it had never compensated the firms or entered into any agreement for the work described in the proposals. 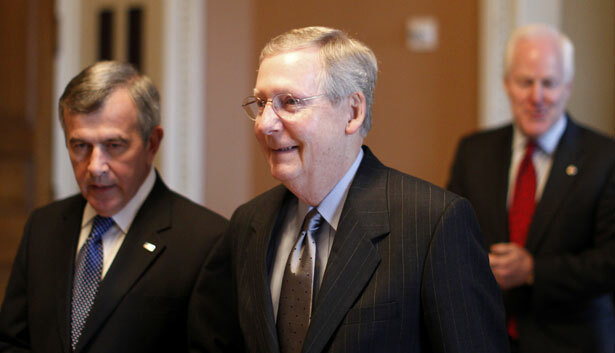 The Chamber and McConnell have a long history of working together. One of McConnell's most trusted advisors, Steven Law, became the top attorney to the Chamber through mid-2010. There's no evidence McConnell had any knowledge of the Chamber plot. However, the proposals in the leaked e-mails make clear that Watergate-style break and entry against political targets is easier than ever, and requires no messy burglaries or "bugs." If law enforcement is worried about political espionage, they should start with one the plot that has an obvious paper trail. In his last post, Lee Fang takes on the political donations that corporations get away with not reporting.